We often came across such phrases in our day-to-day lives whether it’s an ongoing sibling fight, a couple’s argument, or the political parties blame game. A similar feud is now on between PWD (Public Works Department) and DDA (Delhi Development Authority), over the restoration of the ‘Neela Hauz’- a once beautiful waterbody near Aruna Asaf Ali Road. 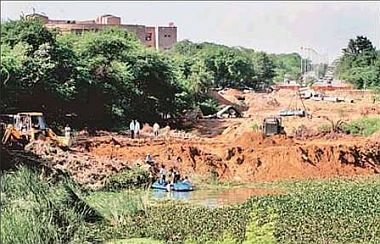 Although DDA claims ownership of Neela Hauz, it states that since PWD was constructing a flyover across it, it was PWD’s responsibility to restore the lake. But PWD seems to have a different say altogether. According to PWD, it was only to restore that area which was under construction and consequently it had no further plans for restoring the lake. But in reality, after PWD started their work on the flyover, (part of the Commonwealth infrastructure) it has been dumping malba in the Neela Hauz thus killing the waterbody. This contradiction has made the state of waterbody worrisome for environmentalists and residents. Neela Hauz was once a beautiful stretch of nature’s creation with a recorded history of over 500 years. It was frequently visited by migratory birds is known for the occurrence of natural ground water. But all the deeds of PWD added to disturbance in the water table and it is no more a lake anymore, as reported by a resident of Vasant Kunj. From further reports it is known that after residents approached L-G Tejinder Khanna, they were assured that there was a clause in the contract tendered by PWD, which made it compulsory for it to restore the lake. To add-on on this, it was further said that PWD will restore the Neela Hauz and a biodiversity park will be made on the land around it! Whatever may be the fate of Neela Hauz but as of now it has become the ‘Fighting Ring of Government Organizations’ threatening Delhi, Delhi’s environment and Mother Nature which is not acceptable in any form. Is the Government doing enough to save and maintain the natural assets in and around Delhi? Are the Commonwealth Games adding to worsen Delhi’s environment and hampering its greens?? – And in the process, making conditions worse for the HEART of the country? today we will never be able to flourish as a society and community . The blame game is entirely become the citizens responsibility now, instead of making a lot of pitch, we as people could have been more responsible and worked earlier also,, i have been in this area for 20 long years, played alongside when kids. Earlier we used to see the water, but now only the weed water hycinth is all that can be seen, as a concerned citizen i also want to contribute to cleaning of this lake or whatever after the bridge is completed,,yes the bridge is important to saveus from trafic jams, but the lake should be restored back again,, there would definitely be more space for the lake as the road presently used can be dug up to make it more appealing,,, and whatnot.